Let us take a look at another budget deck. 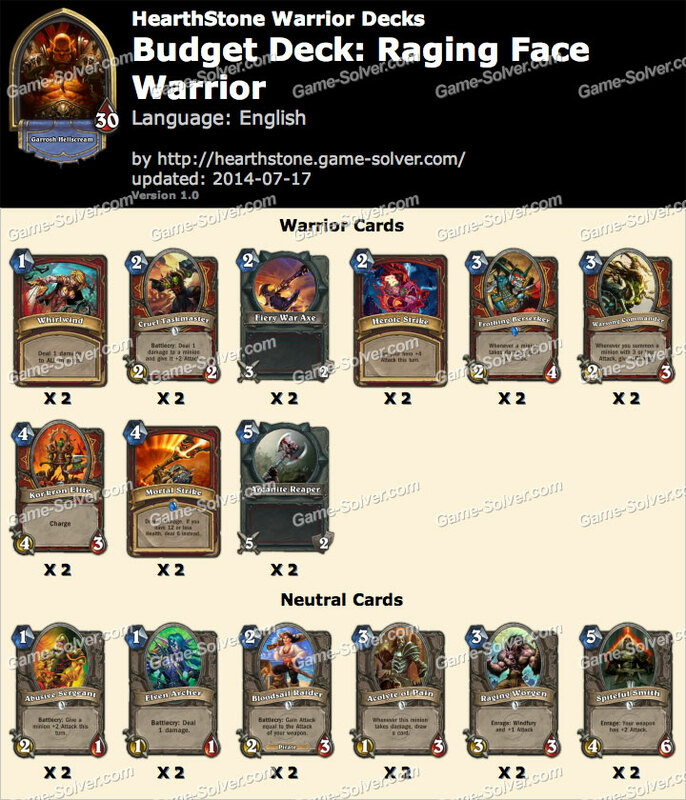 This time, it would be a Face Warrior deck which utilizes Raging Worgen and has good synergies with Warrior cards like Cruel Taskmaster, Whirlwind and Warsong Commander. Since this is a budget deck, there would be no legendaries or epic cards in this deck. But that does not mean it is not a competitive deck. Surprise your opponents with the damage potential of this deck. This deck is built around Warrior’s vast option of weapons and Raging Worgen. Always try to go for face as you have to finish the game before the big taunts come into play. You should be able to present at least 1 or 2 big threats each round, that your opponent has to deal with. When it is really necessary, try chipping away your opponent’s taunts with your weapons to maintain board control. Mulligan aggressively for Fiery War Axe and try to keep 2 or 3 drops. An early Frothing Berserker could do wonders too. When facing aggro decks, try to mulligan for Whirlwind, Elven Archer or Cruel Taskmaster. The combo could also be paired with Whirlwind, Acolyte of Pain and Frothing Berserker for card draw or extra damage.